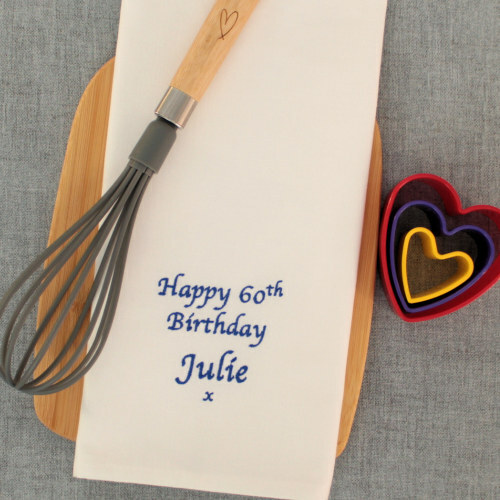 Personalised pure cotton tea towel with a message beautifully embroidered of your choice to make this a completely unique gift. We use 100% natural cotton tea towels with a thick weave which makes them very absorbent. Hemmed on all the sides. 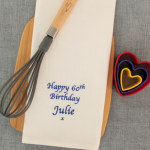 We use 100% natural cotton tea towels with a thick weave which makes them very absorbent. Hemmed on all the sides. A good size tea towel at approx 52cm wide x 72cm long. You can choose the fabric you want from a White Cotton Tea Towel, a beige coloured Natural Cotton Tea Towel, a dyed Black Cotton Tea Towel or a luxury 100% Linen Tea Towel. Enter the Text you want and choose the thread colour and font style. Our example reads Dads Turn to Dry, however you can have any name or little message you want in place of this! Sewn towards the bottom hem. We will produce your gift especially to order and ship your unique gift to you or your chosen recipient. At Amys Gifts we do all our own embroidery work especially made to order and do our best to get all orders dispatched within 48 hours.